Red October has several different rigging options to help give you maximum versatility with their tu..
Re-designed models for 2018 have thicker heads, fuller flashabou tails and all metal beads.Red Octob..
Red October's keel-weighted jerk bait/nose rig. It is centrally weighted so it falls HORIZONTALLY af..
Red October's Mid-Depth rig is designed for the 10" Monster and 7.5" Ninja Tube. It works great for ..
Red October's Deep Monster Tubes are designed specifically for fishing vertically, usually in depths..
Three spare, unrigged Monster Tubes 10"..
Red October's Deep Ninja Tubes are designed specifically for fishing vertically, usually in depths o..
Three spare, unrigged Ninja Tubes 7.5"..
Just like our smaller tubes this 12" version can be cast, jerked, jigged or trolled. Work it slow or.. It is 10" long from tip to tip. It's hollow body really allows for versatility as you can change wei.. It is 14" long from tip to tip. It's hollow body really allows for versatility as you can change wei.. 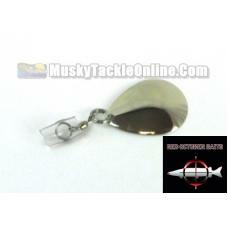 This blade attachment by Red October Baits can be used to add to the rear treble of any of their tub..